Welcome Cillian, a recent OnePageCRM recruit! And without stealing his thunder (sorry Cillian), we’d also like to introduce our latest mobile app, the OnePageCRM Speed Dialer. The brainchild of newbie Cillian, the Speed Dialer is built to save time and maximize impact. It is built specifically for salespeople on the go. Well, that we may never know. What we do know is Cillian arrived to our office late last June with a proposal we simply couldn’t refuse. 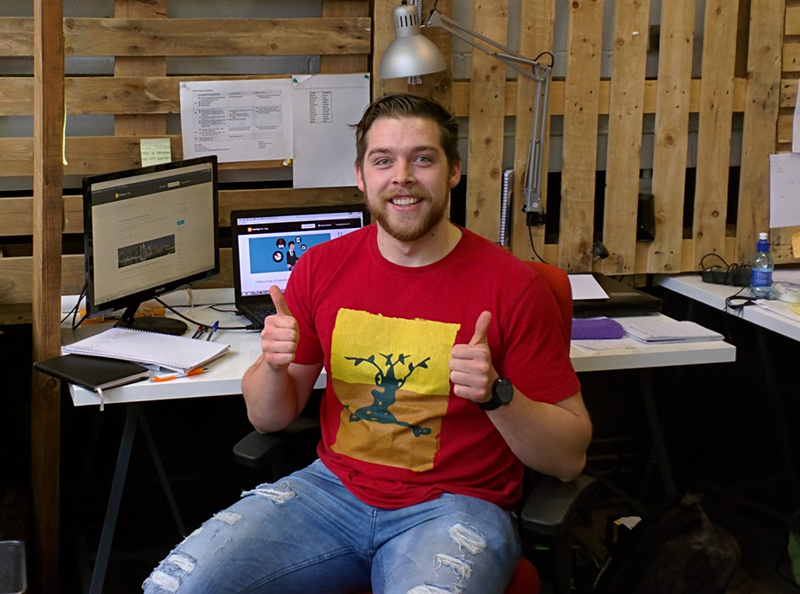 Having always been fascinated by technology, software development was a very logical progression for Cillian, who has a degree in Electronic & Computer Engineering from NUI Galway. He had heard of the wonders of OnePageCRM through his university network and set about impressing us with his knowledge of mobile applications. “I asked someone what could I do to impress this company, they said make them an app. Then I researched sales/GTD methodologies to find an idea and eventually came up with the Dialer”. And impress us he did, so rather than let him get away, we gave him a desk here at HQ. Cillian has been our go-to mobile guy since. If there’s something he doesn’t know about android, then quite frankly, it’s not worth knowing. Cillian’s pet project quickly became part of the OnePageCRM 2015 Roadmap. We’re always on the lookout for any ideas that will make the sales process easier, and this idea was genius. Designed as a standalone Android application, the Speed Dialer allows you to make calls to a list of contacts. Any starred contact with a Next Action and a phone number in the CRM, will appear in the app. The Speed Dialer ensures you have all your prospects in a predefined call list before you hit the road. Typical use case: Spare 15 minutes on the go? Quickly star 3 or 4 contacts before you leave the office. Then en route, use our Speed Dialer to make the calls, without having to search, open, fidget etc.. Result! The streamlined, user-friendly interface allows you to rapidly dial the next contact on the list. You can also quickly log the result for convenience. It will even give you a notification if someone on your list rings you, prompting you to log the call result right from the Dialer app – nifty eh? One of the greatest benefits of using a CRM is that it allows sales teams to get organized and that means more time selling. However, as salespeople spend more time out of the office, it’s a well-known secret that CRM records often get left behind. The Speed Dialer app cuts out the data entry. We look after the admin, allowing you to get on with the more important things, like getting in your next sales call. In keeping with the ethos of OnePageCRM, we’re launching our MVP, so we can get your feedback on all aspects of the product, what features you like and what you think needs improving. We’ll be forwarding all criticisms and compliments to Cillian, so play nice. 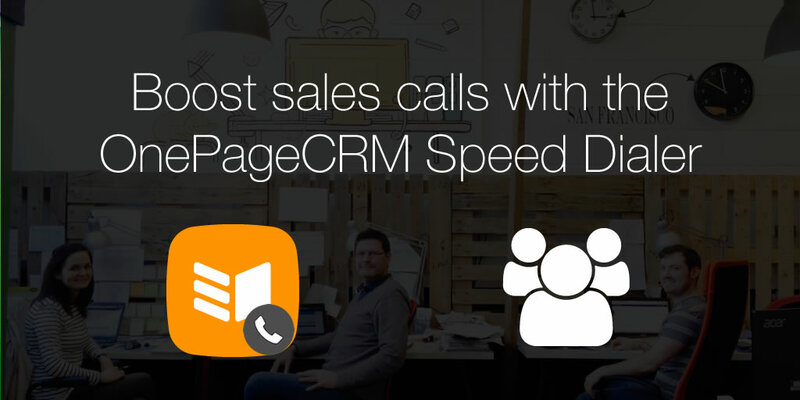 Download the OnePageCRM Speed Dialer from the Chrome Store by clicking on the link below & get selling on the go today! My name is Jeffrey Ram I have been a long time user of OnePage CRM as my business permits. The Speed Dialer App is the future. I am so pissed (in the American sense of the word) that it is not available for Iphone. I am going to switch back to Android right now just to have this app as it is mission critical to my business of running a lead generation company. Please make Cillan’s app the focus of OnePage and not a back room project. Look at apps like Call On the Go for inspiration. Keep going guys. Hi Jeffrey, thanks for your feedback and for sharing the value of the Speed Dialer. Great to hear it’s good for your business, I’ve added your suggestion for iOS for consideration going forward :D Thanks, Brian. I tried android bur sadly am afflicted with the Macfanboyitis. I’m in real estate and you have no idea how cool it is booking more appointments in the car drive to the office than most guys do in a day.